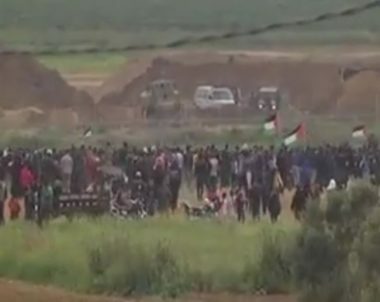 Israeli soldiers shot, Saturday, 49 Palestinians protesting on their lands, near border area, in several parts of the Gaza Strip. The Palestinian Health Ministry has reported that the soldiers shot nine Palestinians east of Jabalia and one in Beit Hanoun, in the northern part of the Gaza Strip, 16 east of Gaza city, 15 east of al-Boreij in central Gaza, in addition to six east of Rafah and two east of Khan Younis, in the southern part of the coastal region. All wounded Palestinians were rushed to hospitals in the Gaza Strip, while medics provided dozens with the needed treatment for the effects of teargas inhalation. On Saturday at dawn, the soldiers fired several artillery shells into Palestinian agricultural lands in the eastern and central parts of the Gaza Strip. In related news, Israeli navy ships opened fire, on Saturday evening, at Palestinian fishing boats, in Rafah. The attack came just one day after Israeli soldiers killed sixteen unarmed Palestinians in the besieged coastal region, and injured nearly 1300 others.